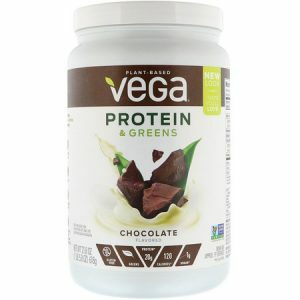 Vega Proteins and Greens vs Vega One - Which one? In this article I will review Vega One and Vega Proteins and Greens to give an insight into two of Vega’s most popular products. It will be a comparison of which shake most compliments your fitness and health goals. I will also compare the ingredients in each shake and their potential benefit. For example, comparing the pros and cons of their nutritional information and how this will impact your health. Vega Proteins and Greens vs Vega One is not really a debate but a education on which shake is better suited for your needs. Both are great shakes and from a great company. If your in a rush, the low down is that protein and greens is a protein shake that contains plant proteins and greens. Vega One is a meal replacement shake that contains extra nutrition such as vitamins and probiotics to act as a meal. Let’s look at the company that promotes these two shakes and why these two automatically get brownie points. Vega have a great range of products ranging from protein snacks, bars, and shakes, to supplements. They have been in the health and fitness industry for some time now and their products have gotten a lot of traction. You can see them on big retail outlets like amazon and popular supplement sites. Vega are a company that were founded in 2001 and then went on to get purchase by Whitewave. Currently they are under ownership of Danone who acquired Vega in 2015. They are clearly a big company that have been around for a while. The fact that Vega have been acquired by companies as big as Whitewave and Danane show that they clearly have products people love and that are in demand. This is not the same for some companies who operate at a smaller scale and whose parent companies are not in the nutritional and health industry. For example, some shakes are from smaller companies and you have to search hard to find what’s really inside of them and if they are from legit sources. Big companies like Danone go under lots of scrutiny when producing products, so at the very least you know you won’t get poisoned by these shakes. Another thing I love is that all products are plant focused. Buying plant based products is clearly the healthiest way to go nowadays. In a society where people are aware of the negative health effects of non-organic foods, dairy, processed meats and sweeteners, plant based diets are what people are turning to. Inevitably a smarter and healthier choice. This for me this is a instant kudo as both vega one and vega protein and greens are protein, plant based foods. By being plant based they cater to a wide general audience and niche health market at the same time. For example, take the demand of a bodybuilder or athlete. For optimal performance, they may want the benefit of plants and superfoods but without soy. It’s hard to find products that meet these exact requirements. It is also difficult to meet the demands of people on a strict diet for health reasons. You may want plant based shake but it contains soy or may be too high in sugar. You may want a protein shake but also not just plain protein but the help of veggies and greens. Essentially, Vega is made for all people – bodybuilders, ordinary, teachers, students, allergic, autoimmune sufferers who want a quick and healthy way to get all the nutrition they need. Let’s dive deep and see which shake is best for you. C(10%),K (80%) Daily Value. Vitamins A, B, C abou 50% of Daily Value. 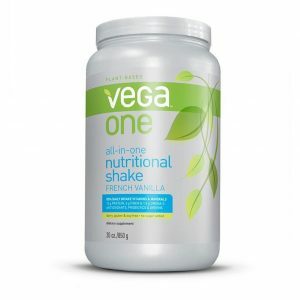 vega one all in one is a full meal replacement shake with the added benefit of probiotics, and vitamins. For example, vega one comes with 2 billion CFUs bacillus coagulans. They are considered the beneficial bacteria. CFU’s bacillus coagulans help with digestion problems, diarrhoea, skin inflammation, respiratory infections and autoimmune diseases. Vega One also contains more vitamins than Proteins and Greens. For example, it contains vitamins that contribute to a higher percentage of your daily intake. Vitamins A, B and C stand all at around 50% of your daily intake. Whereas proteins and greens has 1 gram of fiber, Vega one has 4 grams. Vega Protein and Greens also has less calories. The calorie intake is 110-120 calories compared to 150 for vega one. Does the above mean that Vega Proteins and Greens is a worst shake? Absolutely not. Vega Proteins and greens contains everything your body needs to gain muscle. It contains less calories and is simply more of a protein shake. Vega one is more of a meal replacement shake. What’s the difference? Well a meal replacement is supposed to give all nutrients of a full meal. Therefore a meal replacement will have more ingredients than a traditional protein shake. A protein shakes’ sole purpose on the other hand, is towards providing protein and nothing else, hence its name. However, a protein shake can effectively be a protein shake too. What do you mean you say? A protein shake can be a meal replacement if you add additional ingredients. It all depends what you do with it. Proteins and greens is simply aimed towards providing a sufficient protein intake in a healthy and quick through plant proteins. The greens are just an added benefit. 20 Grams of protein – This shake comes with 20 grams of protein. The great thing is its from a multi-source plant based blend. For example, Protein and green is made from flax, sacha inchi, hemp, and pea protein. All are healthy forms of protein and extra effective when combined together. Some shakes come in one form such as only hemp, soy or pea. However, to get all the benefits of complete protein which includes all amino acids the protein needs to come from a variety of plants. It is great to see that Vega have done their due diligence and found a great combination of plants that together provide sufficient amino acids to make a complete protein. Veggies and Greens – The greens come in the form of spinach, broccoli, kale and organic alfalfa powder. All these greens come with a great nutritional benefit. For example, broccoli provides healthy heart while kale helps a healthy digestive tract. That‘s probably why this shake goes down so easily. Sugar content – What’s really surprising is this shake only contains 2 grams of sugar. This is a very low amount. Some whey protein shakes have sugar that is around 7g or 10. The fact it stays so low means you won’t have to worry about the harmful effects of eating too much sugar. Gluten Free – Gluten free is a huge plus. Nowadays, so many people are allergic to gluten or have trouble eating it. There is also growing concern over the negative health impact gluten can have on your body. I prefer to stay away from the stuff which is why it’s great there is no gluten. Vegan – In general, the shake is great if your a vegan. There are no animal products. Good for working out and losing weight: High in protein allows you to build muscle and shed fat. If you hit the gym and want a plant based alternative then proteins and greens is a great solution. Contains greens – If your worried about not getting your daily greens and then powdered greens can help you reach your daily intake of greens. However, don’t rely solely on a protein shake to get your daily greens. Flavours: Comes in a great range of flavours from coconut almond and salted caramel to berry and vanilla. Vega proteins and greens is not as fully packed with ingredients as vega one – This is not because proteins and greens is a worst shake. Its because vega proteins and greens is made solely as a protein shake. Mainly for post workout. More expensive than whey – It is on the pricier end of the spectrum. Generally shakes made with whey tend to be cheaper. I don’t know the exact reason behind this, however, I believe it’s because plant based are more niche and also not as easily sourced as the overly commercialized whey. In my opinion I am happy to pay slightly more for a multi nutritional shake. You can view their price on Amazon to see for yourself. Taste – Possible aftertaste is not nice. A couple of people do not like the taste of stevia and say it leaves a artificially sweet aftertaste. What it comes down to is pure preference and personal opinion. However, there are also say taste is good. See what I mean over on this listing at Amazon. Soy free: Some people say soy is good for you while others do not. Opinions are very mixed in the health community and research on both sides is not sufficient enough to draw concrete conclusions. I would stay away from using soy, to be on the safe side. soy soy can “feed” breast cancer and act like a estrogen. soy can make people with thyroid conditions worst. People who have under-active thyroid may find their condition getting worse. cystic fibrosis sufferers should stay away. Soy has the potential to make this condition worst. Remember all these views are still uncertain among health experts. As much as their is research supporting negatives of soy there is also research supporting the benefits of soy. However, I think the research is too little to support having soy which is why I’m glad vega one is free of the stuff. Gluten free. Vega is also free of gluten free. Over the past few years the health society has become a lot more conscious to the impact of gluten which is why many people are going on gluten free diets. Any top plant based protein should be gluten free and vega is no exception. Slight difference here is that vega one has flaxseed protein while proteins and greens has brown rice. So protein sources are slightly different. This shouldn’t make a difference though as protein is still multi sourced and from quality foods. Probiotics: Probiotics normally found in whole foods like yogurts, kefir milk, cottage cheese. Some of these contain dairy and are not that healthy so it’s great probiotics is included in this shake. It is a easy and convenient way to get probiotics into your diet. Every whole well rounded diet should have probiotics due to the beneficial bacteria they provide. Gentle on stomach. Nothing is processed in Vega one. Some shakes can cause indigestion problems and discomfort in the stomach due to having lactose or dairy. Vega one is soy free, gluten free, has probiotics and and is all plant based. This makes it very easy to consume. I personally have not felt any bloated feeling in stomach. Easy on the gut – Every ingredient is healthy on the gut. Probiotics, greens, antioxidants, vitamins, all aid gut health. Hardly any sugar – Any top quality shake has to be low in sugar and contain no refined sugar. Sugar content comes from stevia and is only 2g. All organic – I love how vega one is all organic. Organic can be defined as having non GMO (genetically modified organisms), no added artificial preservatives or colours, no constant anti-biotic use. Pesticides may be used but these will not be from artificial sources but from natural ones. Any food labelled as organic must follow strict laws. They go through thorough certification and inspection processes. So to have a organic shake is quite a accomplishment. It certainly is a huge plus and you know your not putting pure crap into your body. Low calories. There are 150 calories in Vega One. Low calories can help you reach your calorie deficit and not leave you feeling bloated. Can act as a full meal replacement. Packed full of ingredients that suffice as a sufficient meal. Price – There are plenty of shakes that are cheaper than vega one. For example, whey protein shakes. However, for all the ingredients that is contained in this tub it’s worth the price. Not 100% in macro nutrients – Vitamin B12, and B6, and vitamin A’s C’s and D’s all come to around 50% of your daily intake depending on your calorie goals. 32 % of dietary fibre is included in the shake. This probably derives from the greens that are included. In addition 20% of your daily intake of calcium is also included in the shake. Everything is not 100% of your nutritional intake. However, this is really being critical and no shake will ever come close to 100% of your daily intake. 32 % of Fiber is a relatively high amount and 50% for vitamins is also not too bad. 50% of nutrition in one shake for the day is super efficient. Taste- Reading reviews online some customers dislike the taste and find it too sweet. Allergic? – Vega products are processed in a factory that may contain soy, peanuts, and egg. So if you are allergic to any of these things best stay away. Not same as whole foods. Whole foods is always healthier than their powdered counterparts. A whole spinach is more healthy than powdered spinach. It’s important you understand this. Too much of anything is never healthy so be smart and don’t overdo with shake. Amazon product page for Vega. It is clear that Vega want to maintain the highest standards when it comes to keeping their shakes plant based and nutritious. Vega is a reputable company and their products Vega proteins and greens and Vega One are both healthy and effective shakes. I would go for Vega all in one nutritional shake if you are looking for a full meal replacement shake and want the extra ingredients of probiotics and antioxidants. In regards to working out, if you want a good protein shake to increase muscle mass or help you lose weight then Vega proteins and greens is best. Proteins and greens can also be made into a meal replacement if you so decide. Add in some carbs like oats, and some fruits and veggies and you have a sufficient meal. It all what you do with the shake. Depending on your goals I hope you make the best choice. Arbonne vs Herbalife – Which Meal Replacement Wins?